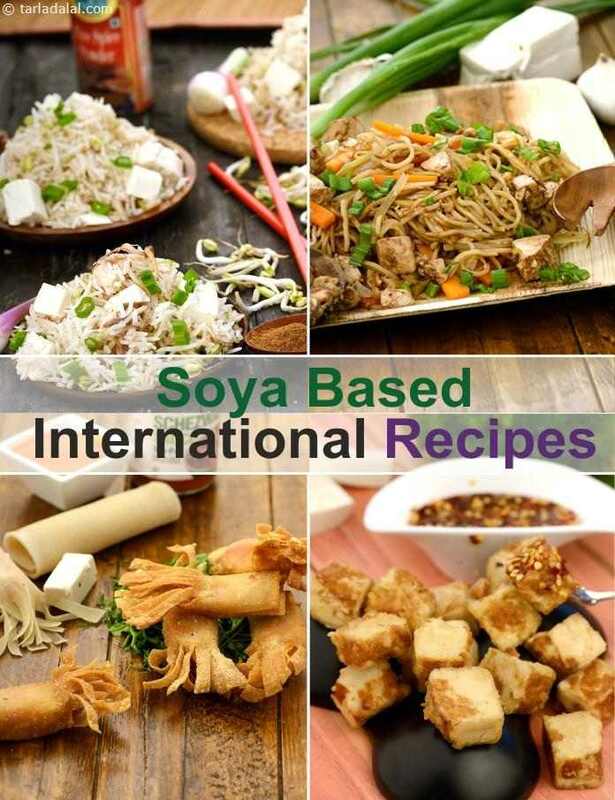 So commonly used in Oriental cuisine, soya is a brilliant source of protein, and sought after by health-conscious people and vegetarians who wish to boost the protein content in their diet. It is a versatile ingredient that comes to us in various forms ranging from soya bean and milk to tofu and soy sauce, not to forget the soya chunks and granules! This makes it easy to include in our diet, in the form of exciting and exotic dishes like the Thai Stir-Fried Noodles with Tofu, Crispy Vegetables and Tofu, and 5 Spice Tofu and Bean Sprouts Rice. An aromatic stir-fried vegetables flavoured with lemon grass. Add more value to the crispy vegetables and tofu by enhancing it with a sweet and spicy sauce. Vegetarian version of the usually chicken-based curry that I tasted on a trip to Vietnam. Noodles, stir-fried with tofu and bean sprouts accompanied by a soya sauce. Soya Chunks and Carrot Pilau, protein-rich pulao, tasty and healthy is made quickly in a pressure cooker with nutritious soya chunks, carrots and a few simple ingredients to spice it up. Serve with papad, salad and curd. tofu-Broccoli medely is delicious stir fry recipe with broccoli florets tosses with tofu cubes, garlic and onion in bean sauce.A tempting main course dish which also looks great on the table. Healthful and delicious soy recipe, Chinese tofu curry is prepared from curdled soya milk or soya paneer( tofu). The tofu is stir fried with onions, tomatoes, Chinese sauces and spices to prepare an amazing culinary surprise, Chinese tofu curry. A protein rich and flavorful Tofu cilantro sandwich ,ready to be served with chilli sauce or ketchup. The tofu cubes are stir fried with fresh chopped cilantro or coriander and spiced up aptly before placing on the bread slices. An easy and healthy sandwich recipe for all. Crispy thai tofu is a crunchy and stir fried tofu recipe with the tofu cubes cut into small rectangles and then seasoned up with sauces, herbs, fried onion and garlic. Enjoy as a tangy spicy starter or crispy cocktail snack. Baked soya roll is a healthier roll or snack recipe with protein packed soya nuggets or chunks soaked and then minced. The minced soya are made into a spicy mixture , stuffed into wheat dough based rolls and then baked till crispy done. Tofu-Broccoli with Figs present a lovely combination of tofu or soya paneer cubes tossed over with dried figs and crunchy broccoli florets. 10 Summer Drinks to beat the heat! Missed out on our mailers? Our mailers are now online! REGISTER NOW If you are a new user. Or Sign In here, if you are an existing member. If your Gmail or Facebook email id is registered with Tarladalal.com, the accounts will be merged. If the respective id is not registered, a new Tarladalal.com account will be created. Click OK to sign out from tarladalal. For security reasons (specially on shared computers), proceed to Google and sign out from your Google account. Are you sure you want to delete this review ?